this blog is moving to blogger! tell your friends and take part in the discussion about genomic integrity! Today is the 6 year anniversary of this blog, which began on 3 Nov 2008 as a part of the domain genomicintegrity.org and has segued to become the blog for AGiR! Action for Genomic integrity through Research! In the meantime I will just mention that the 'art call' for AGiR! - to help increase public interest in genomic integrity by depicting the molecular 'dance' in living cells - is officially open. Looking forward to seeing your vision! Malala gets the Nobel Peace Prize! I believe the Nobel committee didn't give this award to me. I believe they have done this because they believe education is the best weapon through which we can fight poverty, ignorance and terrorism. I believe they did this because they don't believe in just one girl, but in all the girls whose voices need to be heard, who are under the darkness of conflict or poverty. This award is for my powerful sisters who have not been listened to for far too long. And I raise their voices, I stand together with them. Studying chemistry when her teacher told her about the announcement, she kept at her work, continuing to inspire all who have heard about her. Hoping she does not become an even more sought-after target to the fanatics out there, and that one day she may even find the time to become interested by AGiR! 's big picture concept of genomic integrity (if only! ), she, who in her book mentioned the cupboard of her aunt in Pakistan, containing hairdye and guns, an image that still haunts me, must be congratulated and praised! Malala really is a true hero! Well done, Nobel committee (for their 2014 choices in general, it seems!)! What Can FDA Do if a Cosmetic Is Not Safe? FDA cannot require recalls of cosmetics, but works with companies to make sure their recalls are effective. This should help you understand again that it is your choice that is key! Make the right ones! Let Malala's choice to be brave and help make sure that education becomes a true right for all inspire you too! Choose to protect genomic integrity, for yourself and the future! Just thinking about the scientific method and the idea that scientific progress is supposed to always move somehow towards a greater good. Some published work about formaldehyde and also the various ways it can be hidden in various formulations (for instance, as methylene glycol, or as other compounds that ultimately release formaldehyde, like quaternium-15) might not be considered progress. Just have a look at the conflict of interest statement on this paper from last July (2014) by Golden and Valentini. If anyone thinks this is the kind of toxicology study that helps the consumer, I would be more than surprised. Some might even call this a travesty of science (maybe I already have to some people, or even in this blog)! If there is anyone out there with a strong chemistry background willing to look at the three formulations for the old 'no-more-tears' and let me know what they think, please let me know! I will end this with a more positive point. People are interested and concerned, and at a local Women in Science event, I was encouraged also by the clear need for the 'genomic integrity' idea to become generally known. See more about this in the last hot news item from the AGiR! site. I will paste it below and would love your opinion. I am writing about recent coverage in Time magazine (1,2) in regards to scientific publications on environmental and occupational exposures to carcinogenic substances. While your authors nicely point out the clear risk factors for development of diseases like breast cancer and recommend ways to simply reduce risk, as also done in the original publications (e.g. 3, 4), touting this research as shedding 'light on possible nongenetic causes of breast cancer' is really a serious misinterpretation. In fact, causes of cancer are usually genetic; and exposure(s) to the chemicals of concern very likely induce new genetic changes in cells, with most cancers (about 85% of all cases) indeed caused by de novo impact on what has been termed 'genomic integrity,' with outright mutations, DNA rearrangements, copy number differences, and epigenetic 'marks' that affect gene expression, often via RNA-level regulation, the real proximal cause(s) for disease development (5). Since many of these genetic insults are avoidable, and cancer cases, with estimates of up to 50% of the cases occurring today, thus preventable (6), promotion of this big picture concept of genomic integrity, to simplify the complex molecular mechanisms that promote cellular health and resiliency, is in the interest of the public health. This is worth thinking about, for journalists and us all! Secondly, I have to add, I am quite annoyed that almost every main character of the film based on the fabulous John Green book, The Faults in our Stars, had dyed hair (not just the main character with her artistic meshes, but even the father of the boy with bone cancer)!! I hope, again, that the message will get through more broadly! Thanks for your help, those of you who are supporting AGiR! To end on a commemorative note, it is 13 years since the twin towers dropped. I was at the memorial last summer, and will just say it is a visit to recommend. The flyer campaign in English was begun yesterday, to help spread the word about genomic integrity and how we can protect it and hopefully investigate it for better risk analyses. Here in the 'Village,' where about 90% of women and possibly more than 20% of men are dying their hair, groups of smokers can still be found outside (sometimes near 'no smoking' signs) and 'anti-bacterial' soaps seem to have quite a large market, it seems like a good place to start! There has even, it seems, been some response already! Not just nice people that took the flyer (I made bigger fonts for the English version, so it is more legible with 4 copies printed per page), but even a new comment from last night in this blog!! There seem to be a couple more new american flags in the counter too! Thank you! Overall, however, for AGiR! we can say all is aok, with new people and old friends joining in. Soon it will be Fall, and the time for the 2nd Meeting of the General Assembly! But in the meantime, enjoy the rest of the summer! We are into the 197th day of 2014, supposed to be a year 'for genomic integrity,' yet good news about protecting yourself from all the potential dangers out there is not easily found! While people from 23 countries have already visited the site for AGiR! and some interest has been expressed in the flyer campaign, because it is clear that each generation has to learn afresh, at the same time sunscreens recommended as less genotoxic (containing, at least, less benzene derivatives) are often unavailable, as already mentioned in a previous post. Additionally, it is not only the ones found via Amazon with this problem, for example, here is something recommended by another site that is simply not in stock. If it was sold out, shouldn't we see tubes of it at the beach?? In the meantime, something clearly hazardous, like that classic solution for covering gray hair, Grecian Formula, full of lead acetate, is readily purchased from Amazon (as again already mentioned in a previous post)!! This is all very frustrating, and is certainly not a desirable situation for any protection of genomic integrity, particularly for water-sport lovers, who need safe sunscreens. The cult of youth of course leads some to directly poison the muscle fibers of their own face with botulism toxin, the popular BoTox, which seems like a very poor idea for actors, meant to communicate emotion... What can we do?? Additionally, while certain ingredients have been highlighted by various groups, in particular things that are hormone-mimetic substances (some of which are replaced by things potentially just as risky), many are still quite commonly seen in ingredient lists, while others are still under the radar, except in certain cases. For instance, it is very frustrating to have to see four types of acrylamide derivatives in skin creams for women and girls, when one knows it is the classic neurotoxin. One could almost wonder whether some sort of conspiracy against people using their intelligence is in play, with lead in expensive lipsticks (that are obviously licked off and ingested) and plasticizing neurotoxins (the acrylamide derivatives) as wrinkle fillers! I certainly don't like this idea one bit! But why otherwise would such ingredients be put into personal care products?? Silicone is another ingredient, supposedly inert, but used in personal care products quite frequently and perhaps filling our waterways eternally, with unknown consequences. Furthermore, the ingredient methylene glycol (which basically converts to formaldehyde, although there are efforts to deny this in a pseudo-scientific way that was shocking, especially in light of its creepy conflict of interest statement!) is entirely too common in ingredient lists of personal care products, and the super straight brazilian blow out process is still far too popular, even though, as documented by Sharon Neufeldt since 2010 for instance, it also leads to quite high risks of formaldehyde exposure, and thus carcinogenesis. Hoping for some changes, even though this post has turned into a bit of a rant, unfortunately! Thanks for your help and spread the word! The AGiR! flag counter shows 150 Swiss flags today! Site statistics from Google Analytics are also interesting, with over 93 cities last week... As the spanish side gets put up soon, it will be fun to see where this goes with time. the day after a stormy independence day, one wonders about how our dependence on the many things we probably should avoid can be ended. Then, what really gets one down is frustration - is the word really not out at all?? 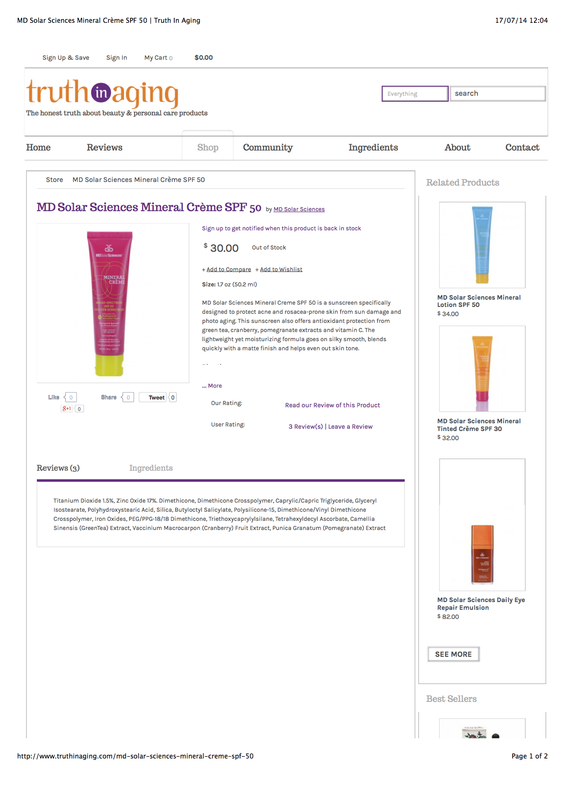 As a concrete example, the other day, shopping amazon for a 'better' sunscreen (none is perfect, it seems), there were several examples of hopefully awesome yet inexplicably 'unavailable' ones. ! 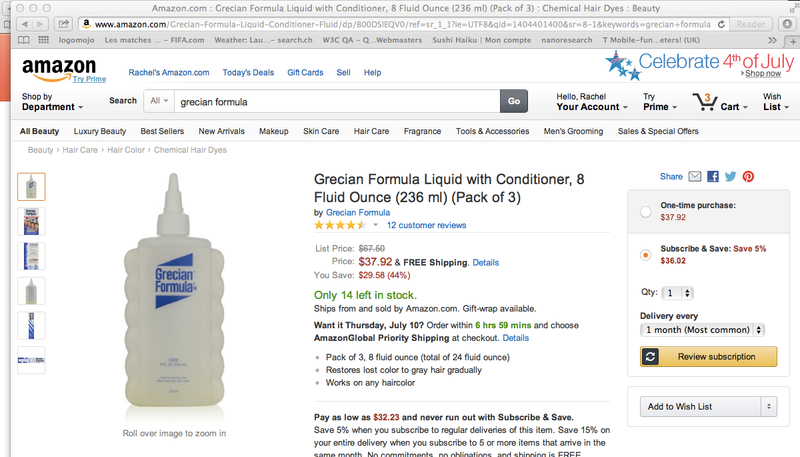 At the same time it is perfectly possible to buy Grecian Formula on amazon!! Who is ready to help spread the word?? The big news today is that this blog has officially left the realm of being just part of the mirror site of the EFV site (for 'end fashion victimization') to become the official blog for the public service assocation, AGiR! Action for Genomic integrity through Research! Check out the new entry and summary/flyer page on the site: www.genomicintegrity.org ! Nonetheless, with contradictory and uncertain reports, following the precautionary principle is advisable. This means keeping your phone in a bag, not your pocket, using an earplug rather than holding it close to your head, staying in one place during a call, so the phone doesn't have to cast around for a signal, etc... But technology moves ahead, and the technical details are sometimes kept secret. Here are two links, anyway (in the hopes that you will want to know), one from the mayo clinic) and the other in the United States from the National Cancer Institute to give you an idea about all this. The latter tells about more research projects in progress, but makes clear that companies are not providing needed info. So what does it mean for us all? The basic advice is still the same.